Its been about a year since I bought the Nike Free running shoes so I figured it was time to write up a Nike Free Review. I was first turned onto buying the Nike Free’s from a couple health and fitness magazines sent to my house talking about how barefoot running is the latest and greatest thing. Some of the articles talked about how these shoes would strengthen your feet and with the way they were designed to flex that the shock of hitting the pavement would be spread throughout the shoe. This intrigued me because of my bad left knee. My running has dropped by 70% since I smacked my knee on ice learning to snowboard in 2004, ran the Detroit Marathon in 2005, and took a line drive off the same knee by my brother playing softball (on my B-Day) in 2009. Running was something I use to like to do but it hurt too much now to go out on a run of over 4 miles. I saw the Nike Free’s everywhere. 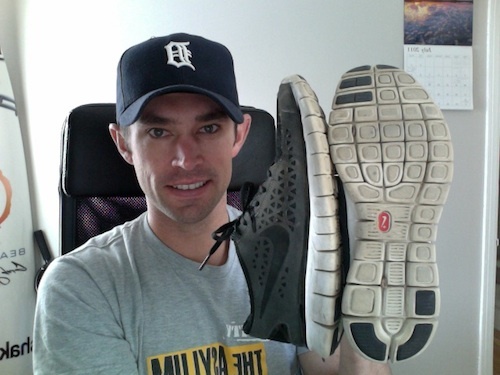 My favorite trainers Tony Horton and Shaun T were wearing them. So they must be a good shoe. I am by no means an expert in running but when my Nike Free’s showed up at my house I saw how the soles were supposed to help spread out the shock. They were very lightweight and probably the most simple shoe I’ve ever owned. It was kind of fun bending them in half. I went with the all black and white soles. Excited to see how they were going to work I went out for a 4 mile run near my house. Nothing intense, just normal sidewalk running while dodging the occasional car or two. The first thing I noticed was how light they were. It felt like I had an extra step or two because I was not lugging around the heavier cross trainers I usually ran with. My time was about the same and I did not notice a increase or decrease in pain in my knees or feet. Since I do not run that much anymore I still have to get in some cardio and I do that through the Insanity workout. There is a lot of high impact and athletic moves in this workout. Have not had any knee problems doing these workouts with previous shoes so I figured I’d be ok. That was not the case. My knees started to act up halfway through the workout due to the jumping. I even had to pause it a couple times and flex my knees to loosen them up. 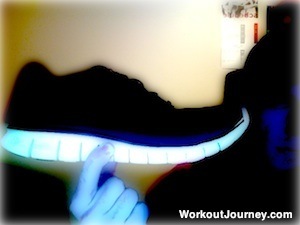 I kept wearing the Nike Free’s during other workouts like P90X Plyometrics, running, and the occasional game. Again, my knees just could not take the pain. What I’m starting to notice is while the Nike Free is good at straight movements it is not good for me at up and down or lateral movements. The weight is not displaced through out the soles from jumping or side to side movements. It felt like I was landing on a rock because there is no gel or air pockets in them. After giving the Nike Free a valiant opportunity to win me over I have to say that this is not the shoe for me. Its not versatile enough. I remember trying to go for a run during the winter (I live in Royal Oak, Michigan) and there was a little bit of snow on the ground. Every time I took a step, the snow would pack in between the soles and started to freeze up. Ten minutes into the run I had an ice pond stuck on my foot. The lack of ankle support bothered me too. Felt like it could slide out of the shoe at anytime. The only thing I liked using them for anymore was to do errands in. They looked cool and were better than wearing sandals. Let’s not forget about the rocks either. Took this picture to show I did wear them and sure enough there were two rocks stuck in the soles. The only fun thing about getting rocks stuck in the soles was dragging my foot over cement and drawing long lines. I’d say that over the year of owning these shoes I probably ran 50 miles, did 40ish Insanity type workouts, half of the Asylum Workout, and walked with them on twice a week to do errands. The barefoot running experience (I’ve read others say the Nike Free is not a true barefoot shoe) is just not for me. The shoes were pretty durable and I’m not sure if I put too many miles on them before replacing them. I can see how it would be a great shoe for somebody who is only about running and does not have knee problems. I use to be that person but not so anymore. Its not that they are bad shoes but out of all the shoes I’ve owned these were the ones that reaggravated my prior injuries the fastest. Owning 4 different pairs of shoes to workout in is crazy in my opinion. I want one shoe that I can run, bike, play games, do Insanity workouts, and anything else involving more than a straight forward movement that does not get my knee acting up. I still wear them from time to time but have already replaced them with an Asics Gel Platinum shoe. Things feel like I’m walking on marshmallows and my knees don’t act up anymore. Have you tried the Nike Free’s? What was you opinion on them? Hope this Nike Free review helps you in making a decision about trying barefoot running. hey man but the link you had isn’t the same shoe could you please get me the precise name and model for the shoe ? Try searching through that link. They probably have a new Nike Free model there now.